Tea has many health benefits as many people are aware. Tea revitalizes body cells, helps fight cancer, and reduces the risk of stroke as well as other diseases. What many people are not aware of are the benefits that also come from the used tea bags. Once you have finished drinking that nice cup of tea don't discard the bag. The following include a number of useful and unique uses for old tea bags. 1. Use to help get rid of foot odor. Add three or four tea bags to a container of warm water and soak feet for 20 minutes. 2. Revitalize tired, achy, or puffy eyes. Soak two tea bags in warm water and place them over your closed eyes for 20 minutes. The tannins in the tea act to reduce puffiness and soothe tired eyes. 3. Get relief from acne. Mix some cool water with a tea bag and then wash the affected area. This will help soothe skin. 4. Get relief from canker sores. Chill a used tea bag in the freezer. Once it’s cold, place it on your canker sore. The cold plus the tea’s healing properties will help your sore feel better quickly. 5. Use to rid your hands of bad odor. After preparing or eating fish and other smelly foods wash hands with cooled tea. 1. Clean wood floor and wood furniture. Boil four or five tea bags in a quart of water. Allow to cool then add to the wash bucket and clean using a soft cloth. 2. Shine mirrors and windows. Brew a pot of strong tea, let it cool, and then use it to clean the mirrors and windows. Dampen a soft cloth in the tea and wipe it all over the surface. Then buff with a soft, dry cloth for a sparkly, streak-free shine. 3. Deordorize the fridge. Place teabags in fridge for the same odor absorption that comes from baking soda. 4. Clean carpets. Sprinkle used dry green tea leaves on the carpet. Leave for 10 minutes and vacuum. 5. Clean the fireplace. Sprinkle wet tea leaves over the ashes while scooping them up to help prevent ashes from blowing all over. Are you a tea drinker? 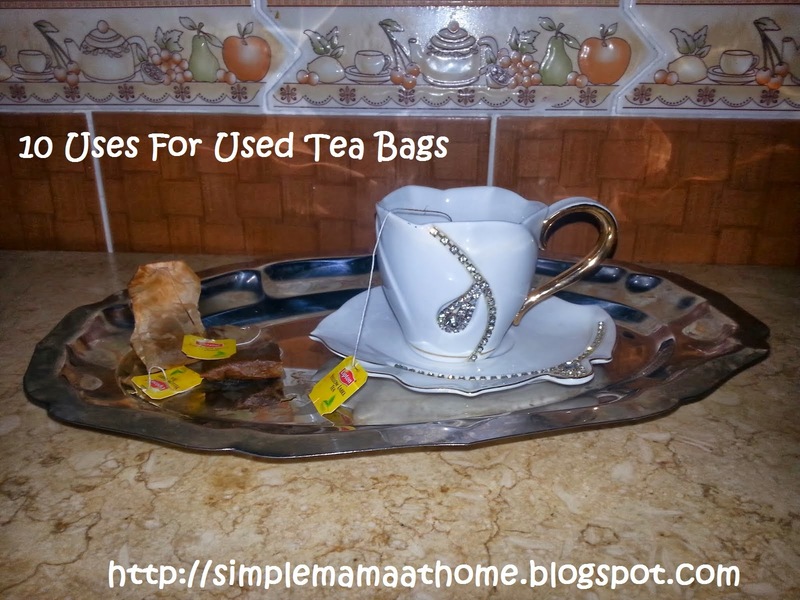 Do you have any uses for your used tea bags? I am always looking for ways to use my tea bags.. Thank you for all the great tips. What great ideas, I drink tea daily so thanks for the tips! that is awesome! i never knew that they had so many other uses! Who knew? Good stuff to know! I had no idea that tea bags could be used for so many things. I can't wait to give some of the ideas a try. OO fun stuff I didn't realize they could be used so many ways. I will have to try the carpet trick today. Mine stinks from the winter and wet dogs. Those are a lot of great tips I never knew of. I drink a lot of tea so I will be trying some. Awesome, I just did a post on teas bags as well! Stopping by from Blogger opps. to say hi! I didn't realize my used tea bags had so many uses. Thanks so much for sharing this. I am stopping by from Lovin' The Weekend. So glad to have you join in this week! Wow I had no idea. While researching a way to help my daughter's chronic eye condition utilizing teabags came up. Interesting! We use so many tea bags. Thanks for these ideas! What awesome ideas! I love tea! We use teabags to get rid of gunk in the eye quite a lot.